Fabric Modification is something that I really enjoy doing, but I haven’t been experimenting much lately. 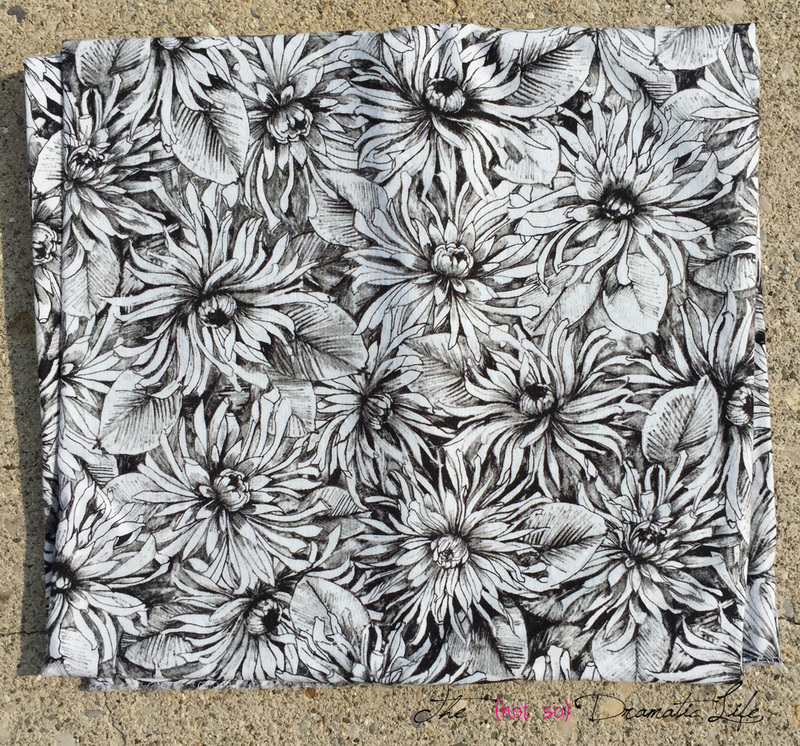 So once I started having fun with the fabric for Fading Florals, I decided to keep going and give Suminagashi a try. This marbling technique uses a nontoxic ink that floats on the surface of water. Using a paintbrush, I touched the surface of a shallow tray of water in several areas with one color of ink. When the next color of ink is applied, it causes the first color to move away. Once the surface of the water was mostly covered, I gently blew across the water and ink to increase the movement of the swirls. 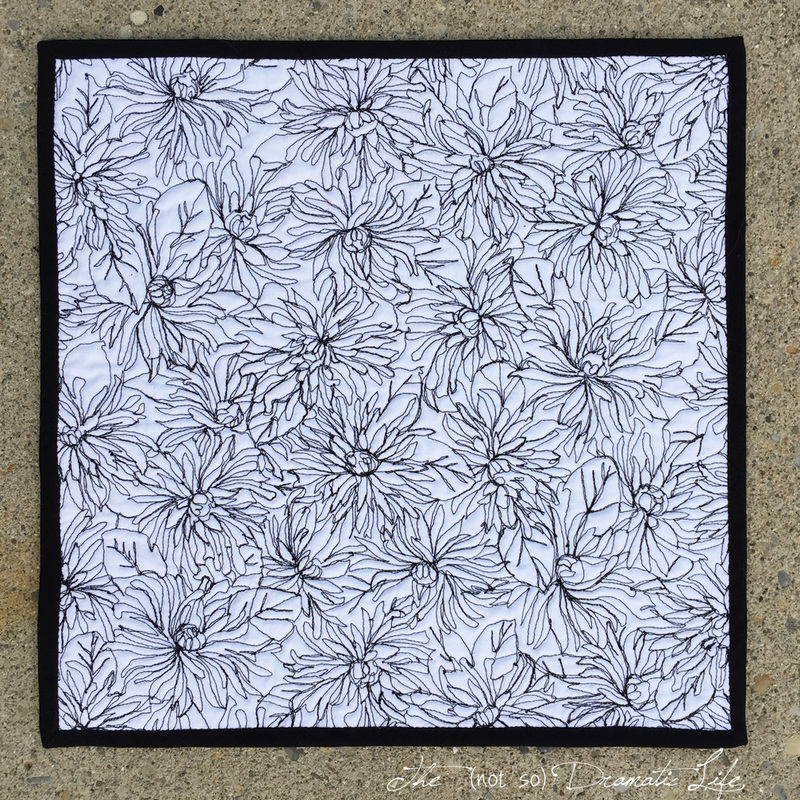 When I liked the design, I carefully laid a piece of white Kona cotton over the inked surface. The dye takes to the fabric instantly so you can pull it up immediately. Once the fabric is dried, heat set, and hand washed and dried, it is ready for use. 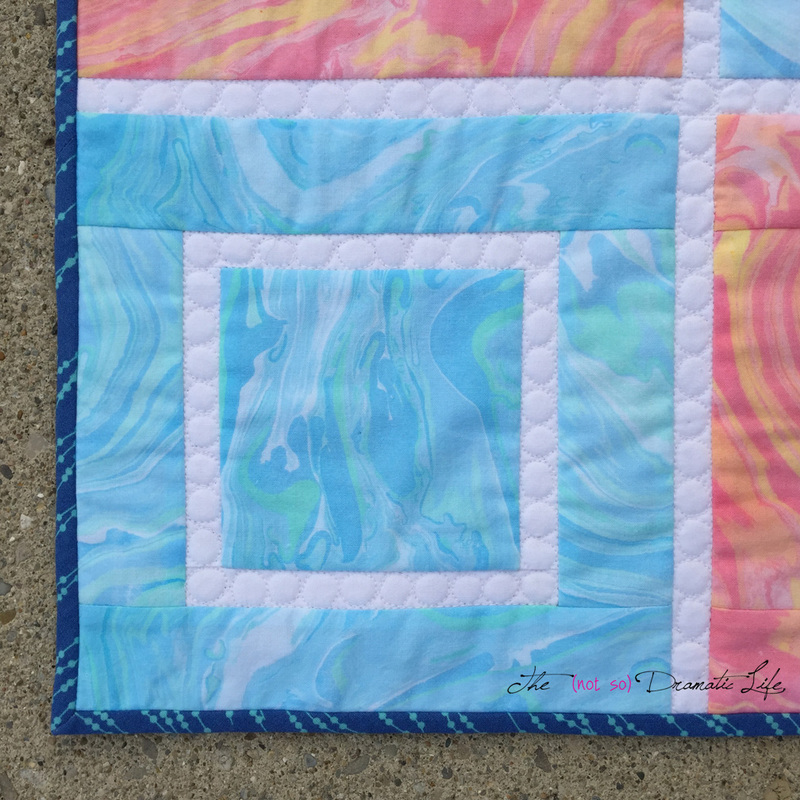 I wanted to have the fabric design be the main feature of the quilt, so I decided on a simple block design. 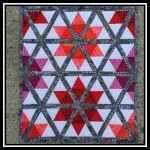 White Kona is used to define the blocks and is the only area of the piece that is quilted. The bands of white are stitched in the ditch and then filled with pebbles. For the backing of the quilt, I went with a solid peach cotton to reflect the warm colored marbled fabric. The binding draws its color from the cool colored marbling. This week I am taking a slightly different approach to a whole cloth quilt. 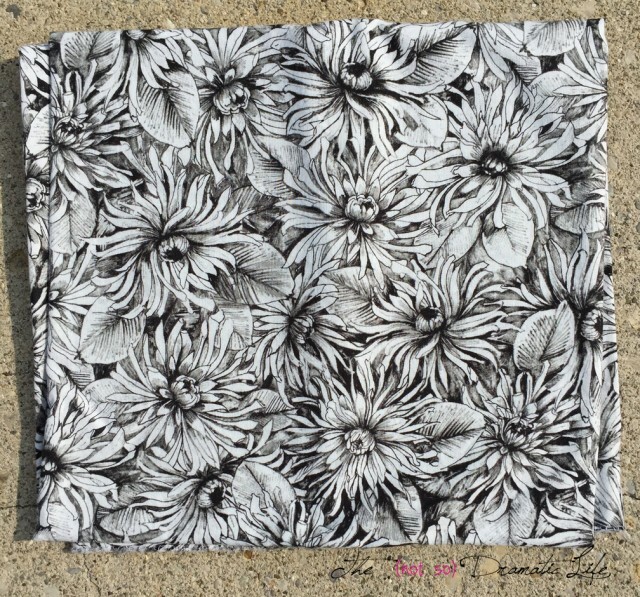 When I came across this fabric, it seemed to call out for some sort of fun fabric modification. I have done some different fabric painting and dying techniques over the years, but I hadn’t had the right project to try this one on before. 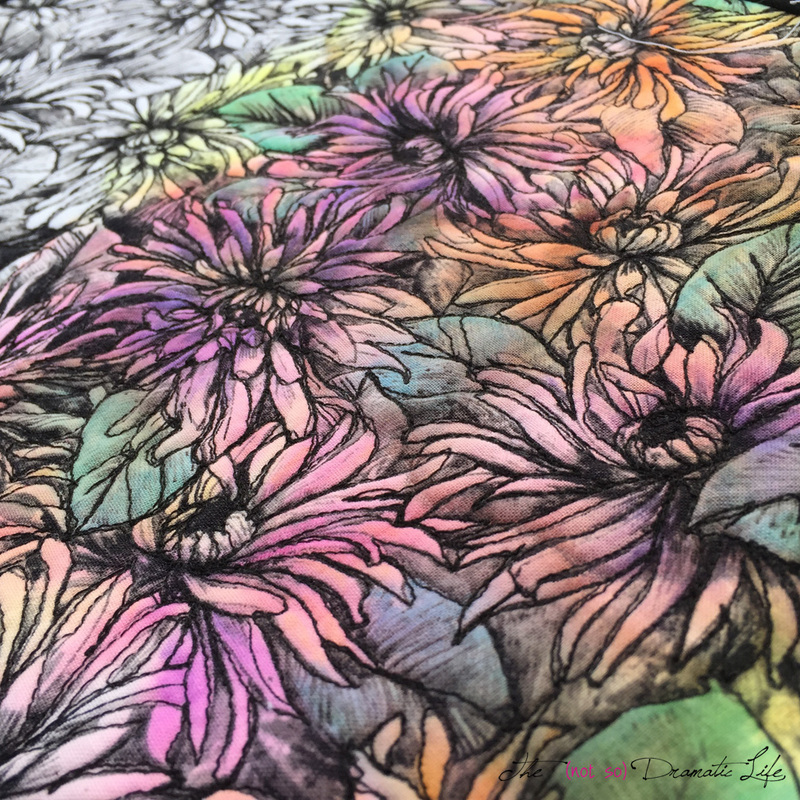 In this process color is added to fabric using Sharpie markers. Using a paintbrush dipped in rubbing alcohol, you paint over the colored areas to create a watercolor effect. 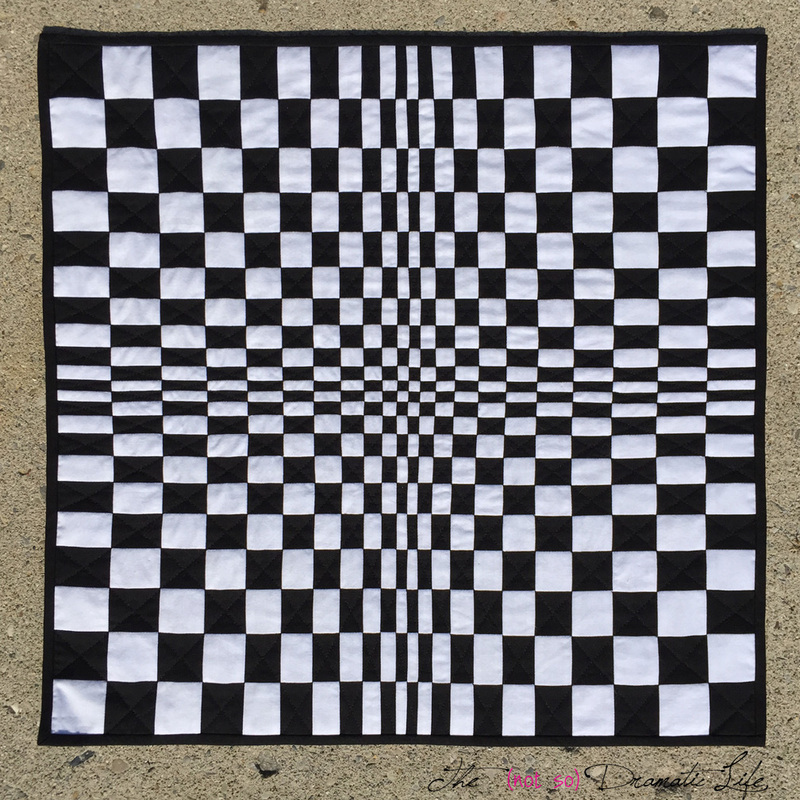 The quilting is a free motion design that follows the printed design on the fabric. The design blends into the front, but stands out nicely against the solid white backing fabric. One of the remarkable things that happens when we quilt is that we start to see quilt patterns everywhere we go and in everything we see. 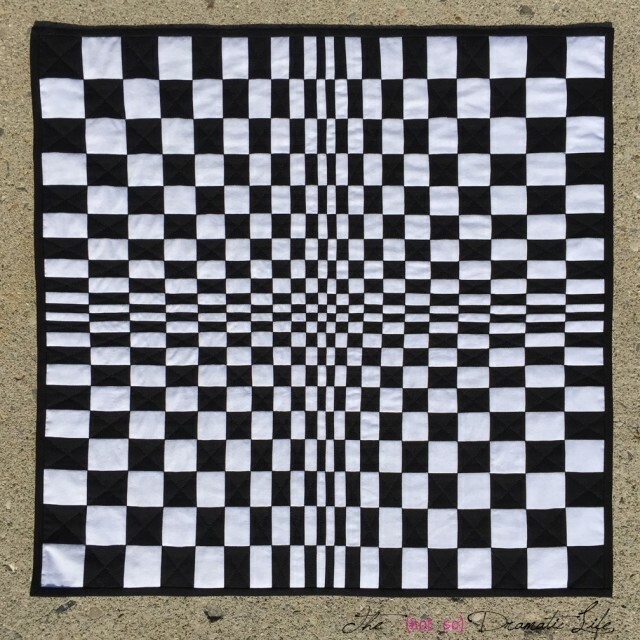 I had been thinking about making a quilt based on op-art for many years- ever since high school when I made a pen and ink op-art painting in art class. It is fascinating to me that alternating different size and color rectangles can trick the eye into seeing dimension in a 2-D object. The largest segment of this quilt finishes at 1-1/2″ x 1-1/2″ and the smallest is 1/4″ x 1/4″. I started this quilt top by strip piecing alternating rows of black and white fabric. Each strip of fabric became more narrow as I worked toward the center of the quilt and then grew progressively larger again. Since this quilt is symmetrical I was able to cut the strip pieced segment into perpendicular strips in the same manner as the initial strip piecing. I then flipped every other row over so the bottom square became the top. This created the grid pattern. 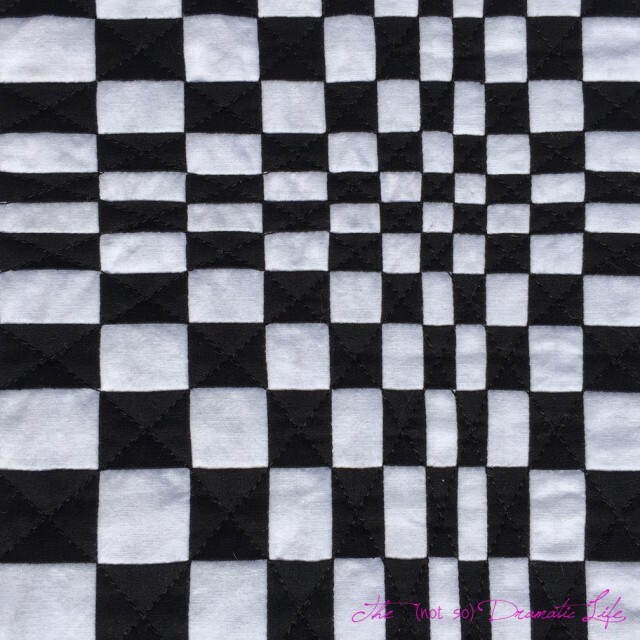 Quilting lines move diagonally in both directions across each black square in the quilt. This creates a subtle design that does not distract from the main optical illusion. The backing and binding is the same black fabric that appears in the front grid. This week I’m linking up with Finish it Up Friday at Crazy Mom Quilts, Show Off Saturday at Sew Can She, Pet Project Show at Pink Doxies, Sew Cute Tuesday at Blossom Heart Quilts, Let’s Bee Social at Sew Fresh Quilts, and Whoop Whoop Friday at Confessions of a Fabric Addict. Please stop by to see all of the awesome work being created! 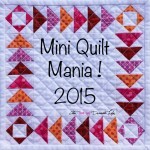 This summer, I am thrilled to have joined up with a group of amazing new quilt bloggers for the 2015 New Quilt Bloggers Blog Hop. I am so happy to be a member of Cheryl’s group, The New Bees. I started blogging in December of 2014 and the first quilt that I shared, Petals in the Wind (Low Volume Fail, Pastel Win! ), is still one of my favorites. 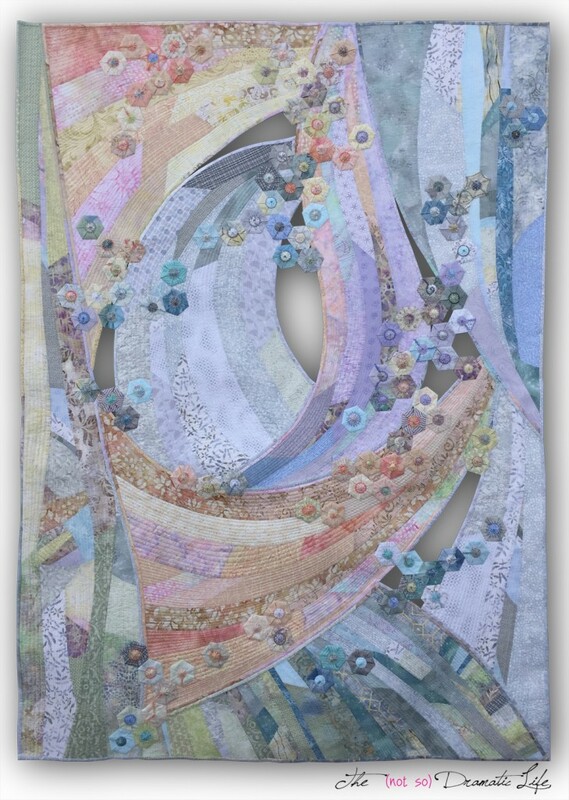 This quilt has been accepted into the American Quilter’s Society shows in Syracuse, Grand Rapids, and Chattanooga this year. 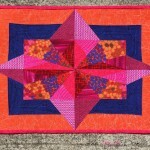 Modern Log Cabin is the first quilt that I made after I returned to quilting last year. 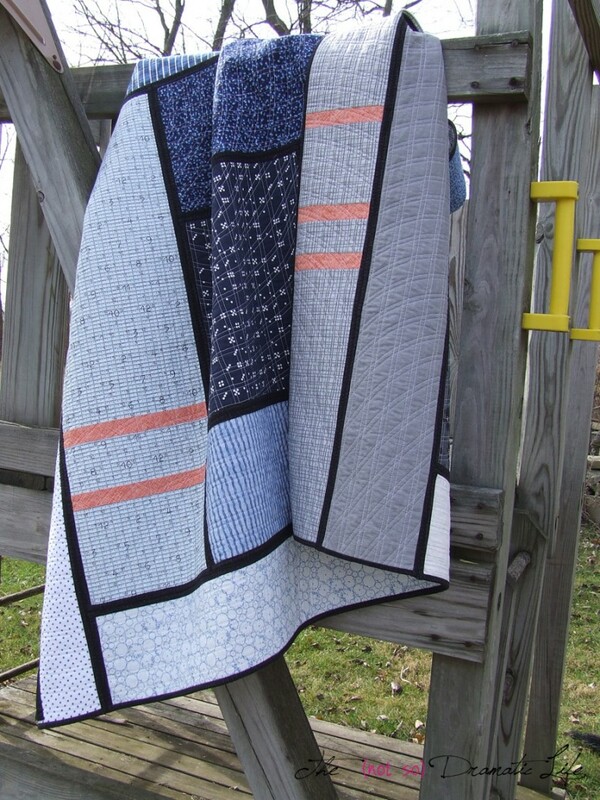 It is a “potholder” style quilt that reverses from grey to blue. 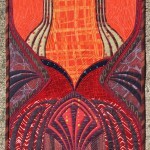 This quilt was exhibited at the AQS show in Paducah earlier this year and will also be in the Modern Quilt categories at Grand Rapids and Chattanooga. Now that you’ve seen a bit of my work, would you like to hear how I got here? How did you learn to sew? My Mom started teaching me to sew before I was even in Kindergarten, so the details are a little hazy. 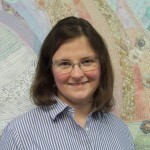 My first quilt was completed when I was about eight, and once I was old enough for 4-H, I did sewing projects every year for the next decade. 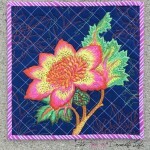 As I grew older, I moved away from quilting and toward clothing construction. Quilting by hand was just so painfully slow, and after finishing one twin sized quilt, I was done. In high school I did make a couple of machine quilted jackets that I received student awards for at the American Quilter’s Society Fashion Show in Paducah. What did you do then? I went off to college to get a BFA, and since I could sew, I was assigned to do my work-study job in the costume shop of the Drama Department. I ended up double majoring in Painting and Theatre Design and Technology and later went on to earn an MFA in Scenic Design. I have worked with many theaters over the years, including ten seasons with the Utah Shakespearean Festival, and have worked at a few universities as well. What has Theatre taught you about sewing? I am pretty sure I can sew almost anything at this point. I have created custom patterns and constructed clothing for almost every historical period, sewn stage curtains and drapes, done upholstery, and devised stage props ranging from drawstring bags to a 25′ long pleated, cylindrical (and very phallic), pink velour pillow with tassels at the ends. Knowing that something very specific has to be created within a certain time frame means there is little time to worry about messing it up- at some point you just have to dive in and make it happen. You also become really adept at solving the “challenges” that seem to develop with each project. This is excellent preparation for devising quilt patterns! 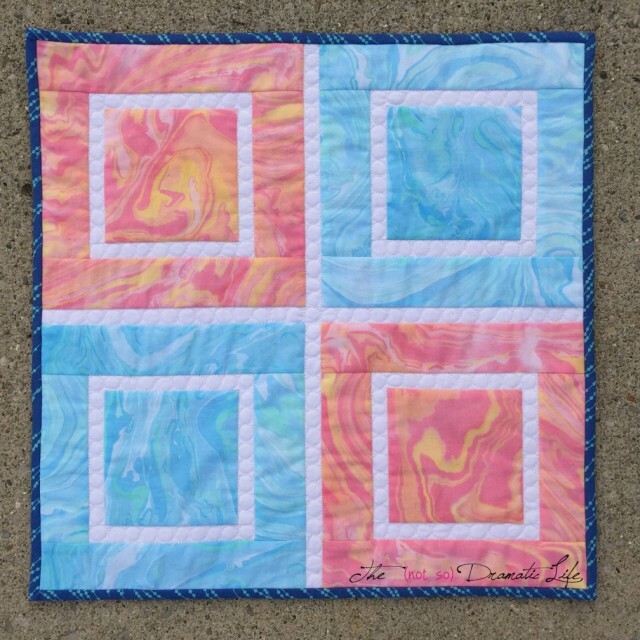 How did you return to quilting? I was at a job where I wasn’t required to sew a lot, and I thought that maybe I would sew something for myself. I wandered into a locally owned shop and was stunned to see all the new quilting fabrics. Pair that selection with fact that machine quilting is now far more acceptable (even expected! ), and I was hooked! 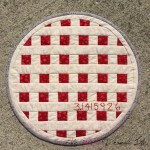 Quilting Tip: Every once in awhile create your own challenge. Limit it to a small, quick project like a mini quilt or simple bag. Restrict parameters so once you start so you will have already limited the choices you have because sometimes having infinite options can really slow us down. I like to preselect a project, color scheme, and time frame. An example could be: One weekend to create a quilted bag using only the colors of black, white, grey, and green using fabrics and supplies already on hand. These small projects can force us to think creatively and can help improve our problem solving “toolbox” for other larger projects. 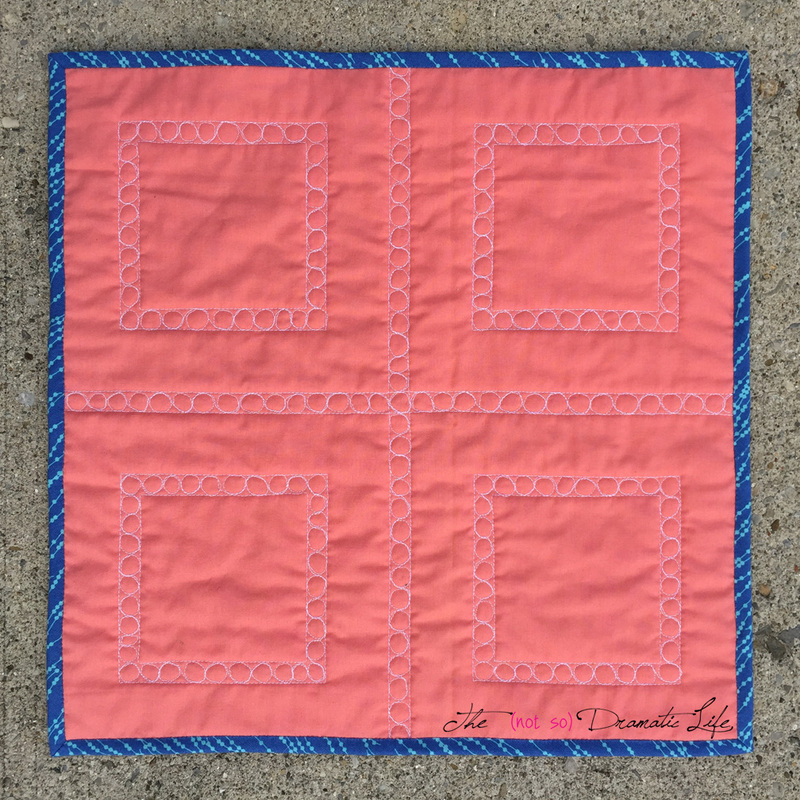 Blogging Tip: At the beginning of the year I created a eight inch square mini quilt that I have used as a background image for all blog “signage” that I have needed. It provides a consistent element within the blog, and I always have an image available for posts that don’t have a feature quilt picture. Right now I do freelance work. Most recently, I worked as a draper (costume pattern maker) for the Summer Nutmeg Series of the Connecticut Repertory Theatre. If you would like to see photos, please check out their Instagram at https://instagram.com/ctrepertorytheatre/ This summer we did Les Mis, Peter Pan, and Xanadu. The metallic silk chiffon dresses for Xanadu are especially fun- so shiny! My most commonly requested baked good is a chocolate cupcake with peanut butter filling and chocolate cream cheese frosting. Yum! 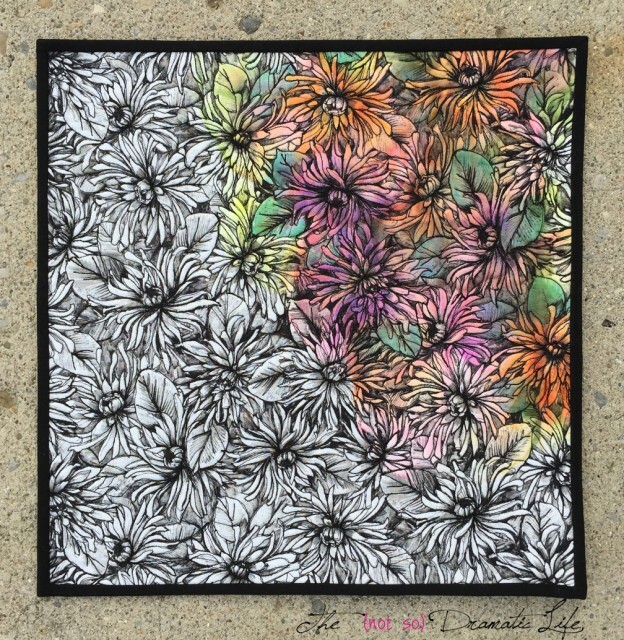 I have been thinking a lot about gathering inspiration for quilt designs and color schemes and will probably be writing a post on this soon. What are your thoughts? Where do you find your inspiration? 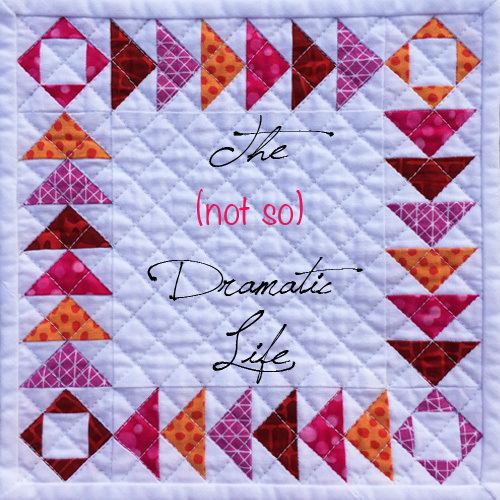 Do you tend to be more inspired by quilt related items (books, magazines, quilt shows, etc.)? Or do you tend to draw more inspiration from seemingly unrelated sources (art, nature, architecture, etc.)? Is it a combination of these? Thank you so much for coming by, and I hope to have you visit again! 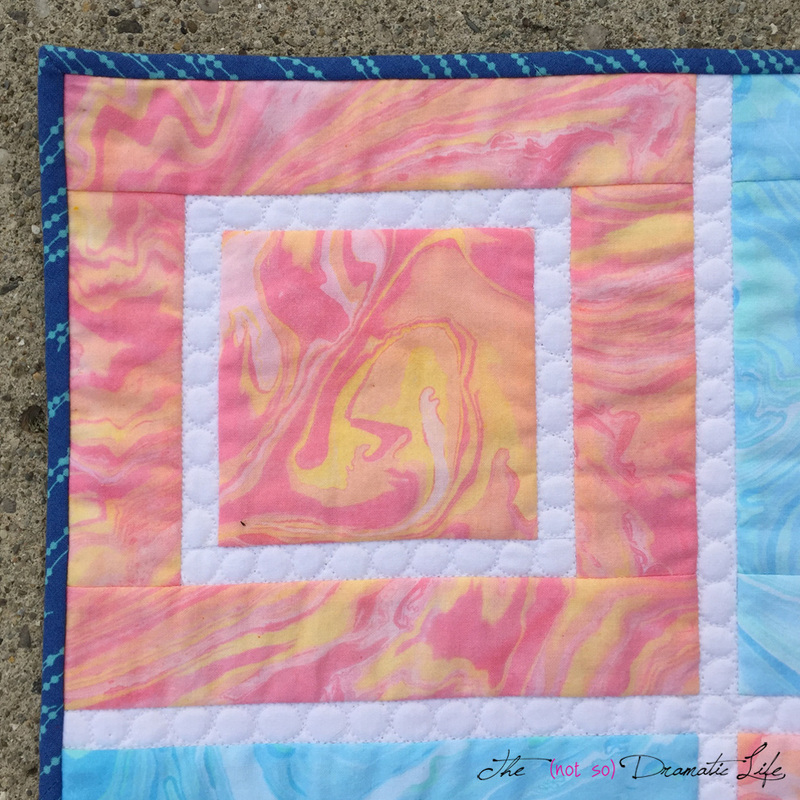 My second entry to this Spring’s Blogger’s Quilt Festival is Petals in the Wind (also known as Low Volume Fail, Pastel Win!) 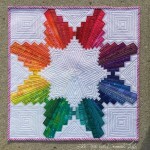 This was the very first quilt I shared on this blog, and I am really happy to be able to show it again! 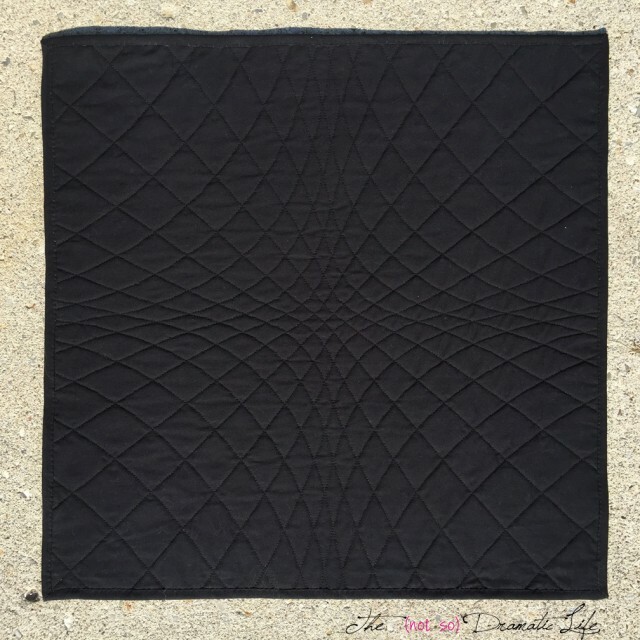 With this quilt, I was interested in creating a sense of movement and explore the use of negative space. In this instance, the idea of negative space has a very literal interpretation. Each area of the quilt was created as a separate segment. 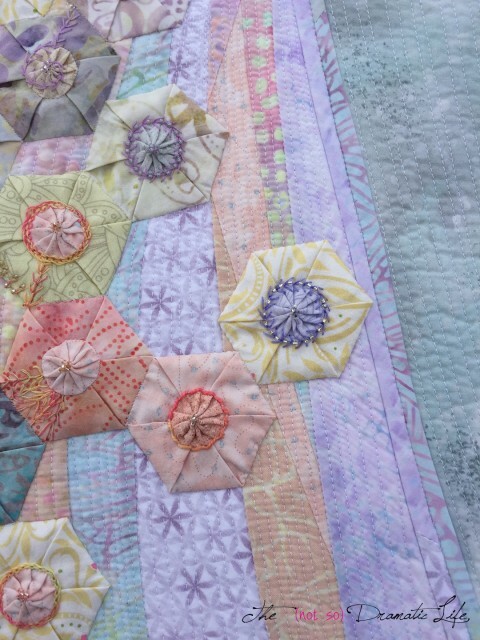 When these pieces combine, there are open area designed into the quilt. 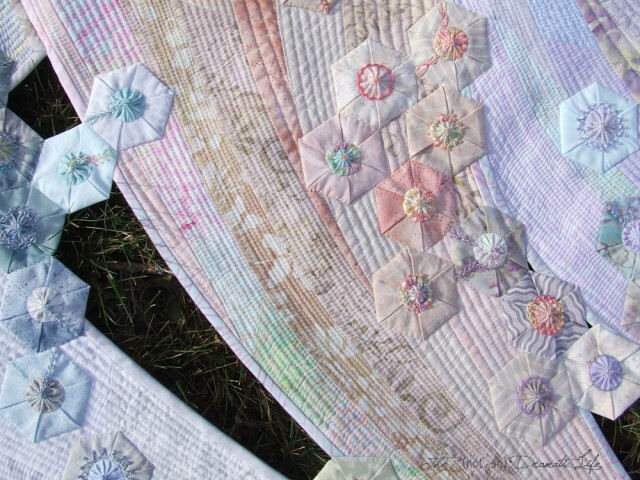 Each section is constructed using curved improvisational piecing, heavily quilted with lines that emphasize the curves of the piecing, and the edges bound prior to joining it with other sections of the quilt. 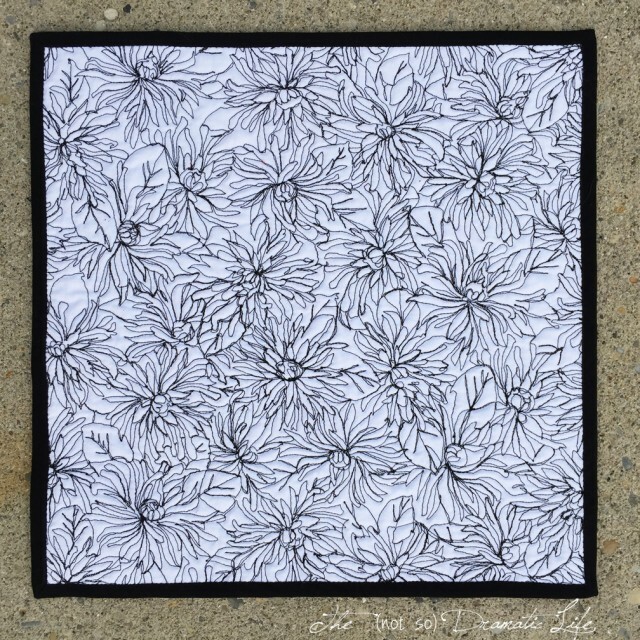 If you are interested in reading more about the design process involved with this quilt, please stop by the original post for Petals in the Wind. A Spring breeze has many small gusts which join together to gently rustle through young foliage and toss colorful petals through the air. 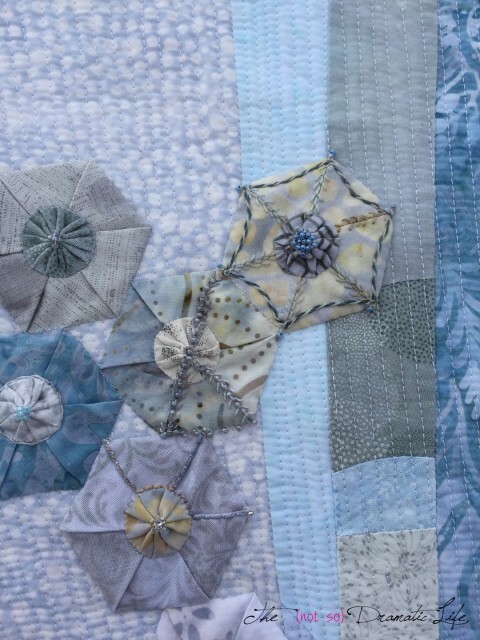 By creating the quilt in sections, I hoped to add to the visual movement of the piece and create a feeling of that Spring breeze. The open spaces represent moments of calm on a windy day. 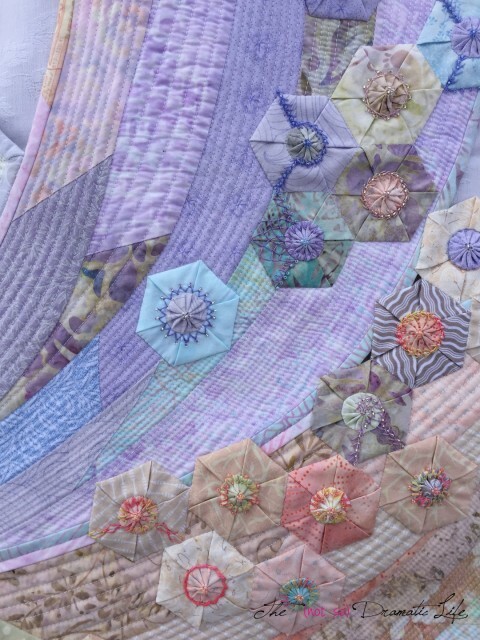 In this quilt, the petals are represented by hexagons appliquéd throughout the quilt and in the spaces between segments. 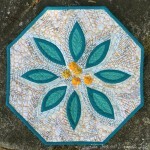 The hexagons are created by folding a circle (I have shown a very similar technique in this post), then embellishing the shape with a fabric yo-yo, cotton and silk threads, and glass beads. 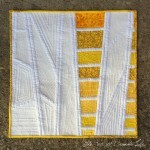 This quilt will be in the Art Quilt Category of the Blogger’s Quilt Festival. The Festival is currently open for entries and nominations for viewer’s choice. Please stop by to see all of the lovely quilts that have been entered, and come back between May 22-29 to vote for your favorites in every category! What’s Next for this Quilt? 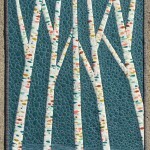 Look for this quilt at the American Quilter’s Society show in Syracuse, NY later this year!